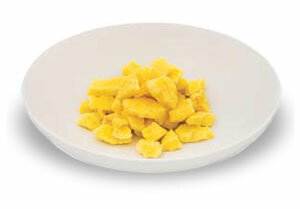 We cracked farm fresh eggs, then pasteurized and seasoned them to create the perfect scrambled egg mix. All you need to do is boil in bag and serve for perfect scrambled eggs – every single time. Once opened, use within 2 -3 days. For best results, prepare from a fully- or semi- thawed state. Immerse bags in hot water (75°C (167°F)) in a large stock pot or steam kettle. Simmer for about 35 mins (from thawed) or 50 mins (from frozen), stirring or shaking bags about every 5 minutes for uniform cook. When cooked to desired texture, knead bags to break up eggs and slit to serve. Do not overcook. Eggs will continue to cook while being held. INGREDIENTS: Whole eggs, skim milk powder, corn syrup, salt, xanthan gum, citric acid, sodium phosphates, annatto. 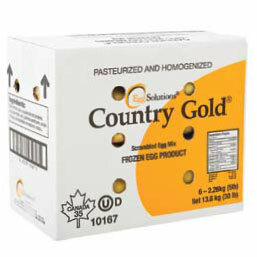 We’ve cracked farm fresh eggs, added just the right seasonings and scrambled them perfectly. Then we’ve quick-frozen them so they’re ready when you need them – every single time. For best results, prepare omelets from a fully- or semi- thawed state.